The Skinner North Math Team meets throughout the year and is coached by upper grade math teachers, Mr. Marsden and Ms. Ridgway. Team members typically meet once a week for one hour. Members have the option of attending with Mr. Marsden after school or Ms. Ridgway prior to the start of the school day. 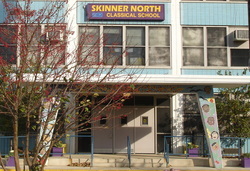 Skinner North attends approximately six math competitions during the year.